This weekend a friend was in town, and visitors are great prompts to do all the local things we don’t get around to — in this case, the new Exploratorium! Something that caught my eye is their name for exhibit guides: Explainers. It’s a miniscule detail compared to the immensity and wonder of all the hands-on exhibits, but this struck me as truly the perfect word. In contrast to titles like Docent, Explainer is simple, kid-friendly, and communicates exactly what they do. 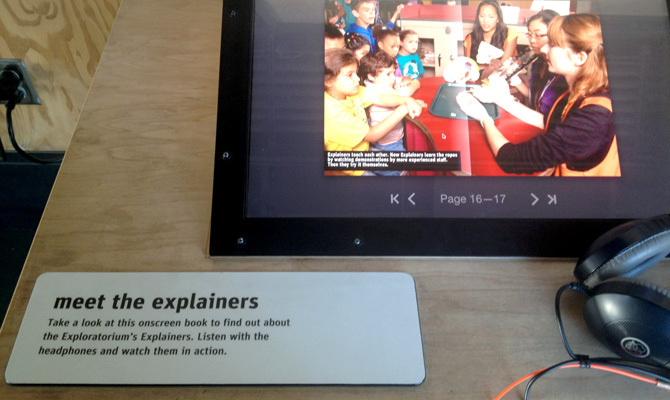 Bonus points: Exploratorium Explainers is alliterative! While small, this is a touchpoint that reinforces a playful, thoughtful brand experience.